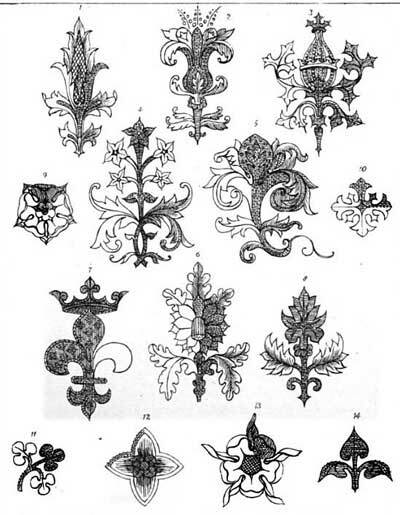 Illustration taken from Anastasia Dolby's 'Church Needlework Ancient and Modern', 1867. Church Needlework: Ancient and Modern was published in 1867 by Mrs Anastasia Dolby. The ensuing year she published Church Vestments: Their Origin, Use and Ornament. Some years later, in 1872, Mrs Dolby became one of the founders, together with Lady Victoria Welby, and the first director of the Kensington School of Needlework, later to become the Royal School of Needlework. Source: EDWARDS, Joan (1976). 'A survey of English literature of embroidery, 1840-1940', The Bulletin of the Needle and Bobbin Club, Vol. 76, pp. 3-20. Dowload here. The book can be downloaded here (retrieved 20 November 2016). Digital source of illustration (retrieved 20 November 2016).